We arrived at Termini Station in Rome at about 4.30 pm and went straight to metro line A to Spagna (Spanish Steps). From there, we had to walk for about 20 mins to the apartment that we booked via airbnb. Rome is well-known for its cobbled-stone pathway so it was a bit challenging to drag our luggages from the metro station to the apartment. In addition, the street name wasn’t really obvious so we had to depend on the map on our smartphone to find the apartment. Although it was a bit drizzly when we were at the metro station, luckily the rain stopped along our way. 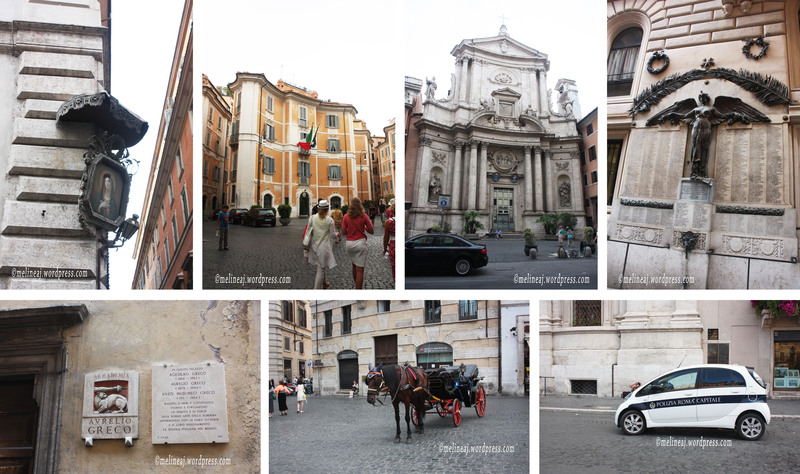 After getting settled in our tiny apartment, we went out to Piazza Navona that was just 5 minutes walk. Piazza Navona is one of the biggest courtyard in the Rome. 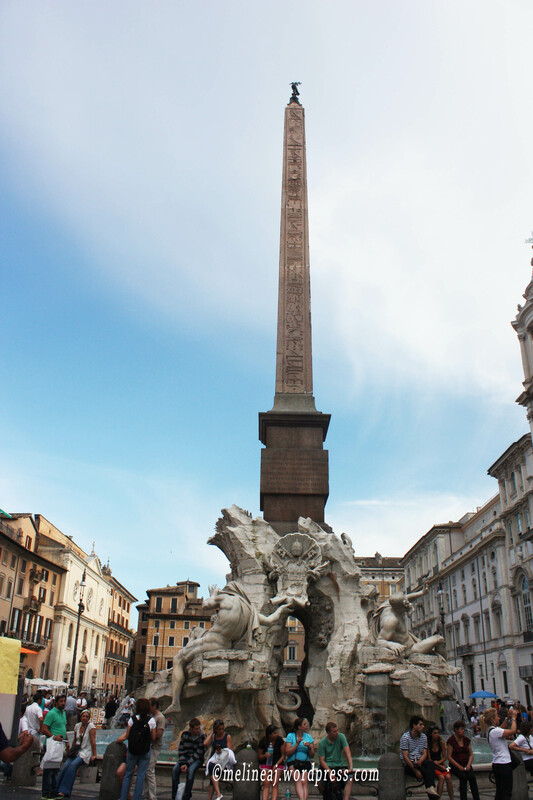 It has 2 small fountains at each side and the famous Fountain of Four Rivers (Fontana dei Quattro Fiumi) with an Egyptian obelisk at the centre of piazza. Around the piazza, there were lots of restaurant with lots of table at the terrace facing the piazza. At the middle of the piazza, there were lots of small stalls selling paintings and some street artists offering to paint you in cartoon style. Nearby, there’s a beautiful church, Sant’Agnese in Agone and we peeked inside to see the beautiful decorations. However, the church was closed for tourist. So, we just took some picture in front of the church. At one of the corner of Piazza Navona, there’s a gelato shop called Grom gelato. Before the trip, I googled the best gelato shops in Rome and some travellers mentioned that Grom’s gelato is pretty good. We tried a cup with 2 flavors: Crema de Grom & Dark Chocolate. For me, the gelato was just okay (Well… wait until I introduced you to Giolitti on day 8 – which is the BEST gelato in the world! *for me* hahaha….). 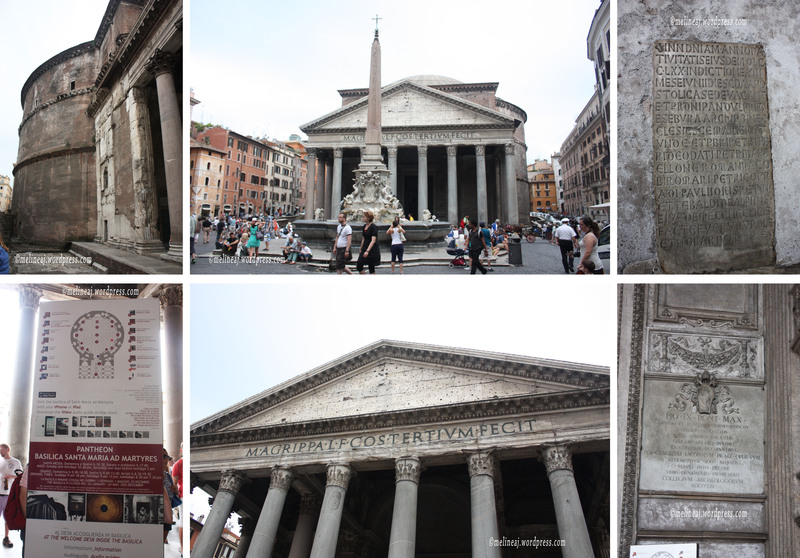 We then continued our tour to Pantheon. When we got there, it was already 7.30 pm and it was the same time as the closing time of the site. Luckily, the entrance to Pantheon is FREE and it was pretty close to our apartment, so we decided to go back the next day. We walked south toward the crowded area (since up ’till this point we didn’t really know where else to go) and we stumbled upon a church on the side of the street, Basilica di Santa Maria in Via Lata. We only took a peek from the front glass window since there was a service going on. The gold decoration inside the church makes the church so grand. We walked to the end of the street until we reached Piazza Venezia. At the corner of the street, there stands Palazzo Bonaparte. This building was bought by Letizia Bonaparte, the mother of Napoleon Bonaparte, who spent the rest of her life there. 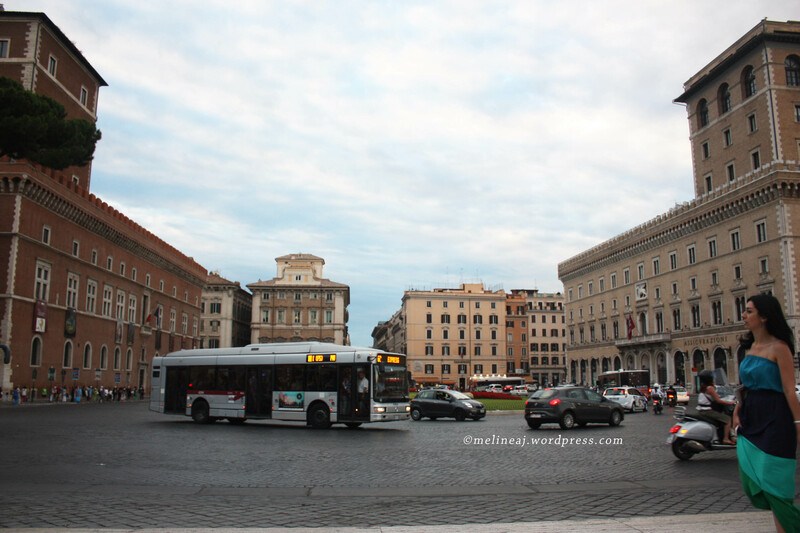 Piazza Venezia is probably one of the busiest circle in Rome. At the other end of the circle, there’s a massive white building with a statue at the front that is called Altare della Patria / Il Vittoriano (we didn’t know what this building was called until we googled it later the night hahaha). The building was closed with a gate at the front and we saw some securities walking up and down at the balcony above. There were lots of tourists taking picture at the front gate and there were a pair of gladiator actors. I saw on TV show, these gladiator actors acted like you can take picture with them but at the end, they’ll ask you for money. And it ain’t cheap! So beware…. 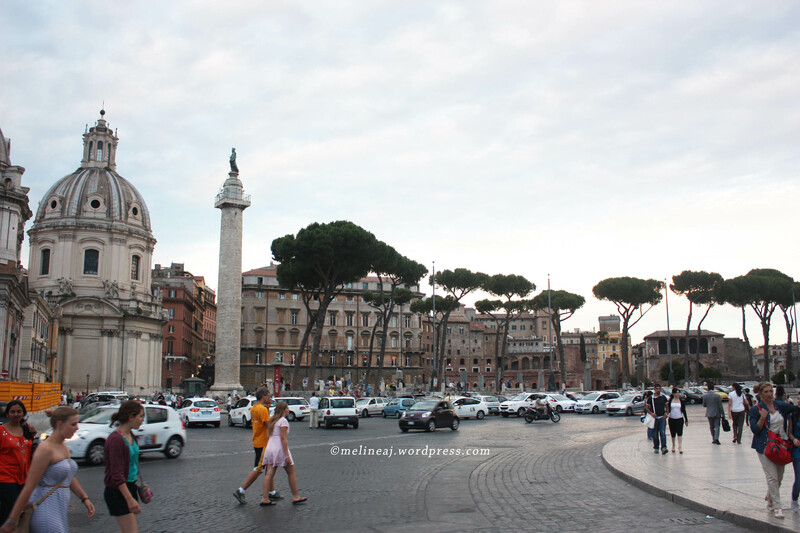 Behind the Il Vittoriano is actually the Capitoline Hill that is part of Roman Forum. Since it was almost dark and I already assigned another day to roam Roman Forum, we walked back toward our apartment through different route. We passed Oratorio Del SS. Crocifisso and a beautiful passageway that looked as if it was glowing due to the golden paint on the wall reflecting the light from the skylight. We explored the small street near Trevi Fountain and found a tourist shop that sells cheap – well cheaper – magnets and mini replica of Italy’s iconic sites (such as Colosseum, San Peter’s church, and Pisa Tower) for only €1! 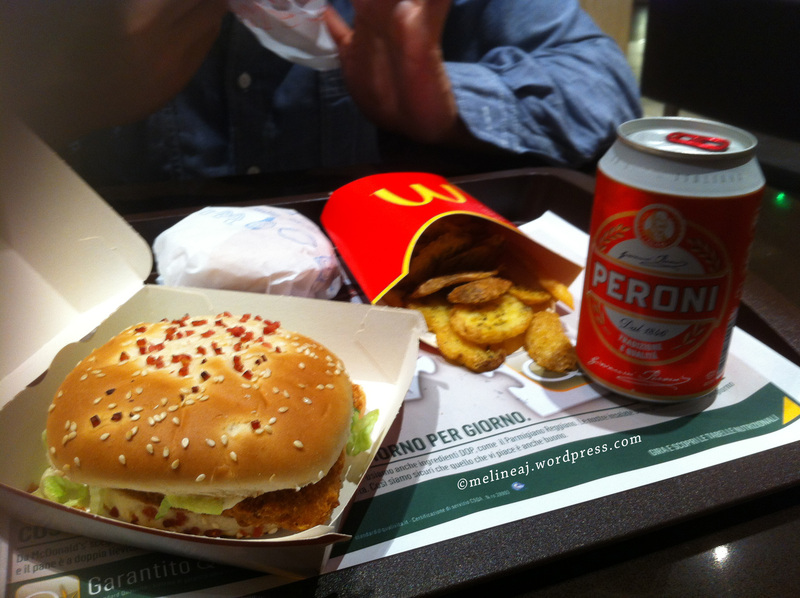 Mc Donald’s combo with beer… Only in Europe! 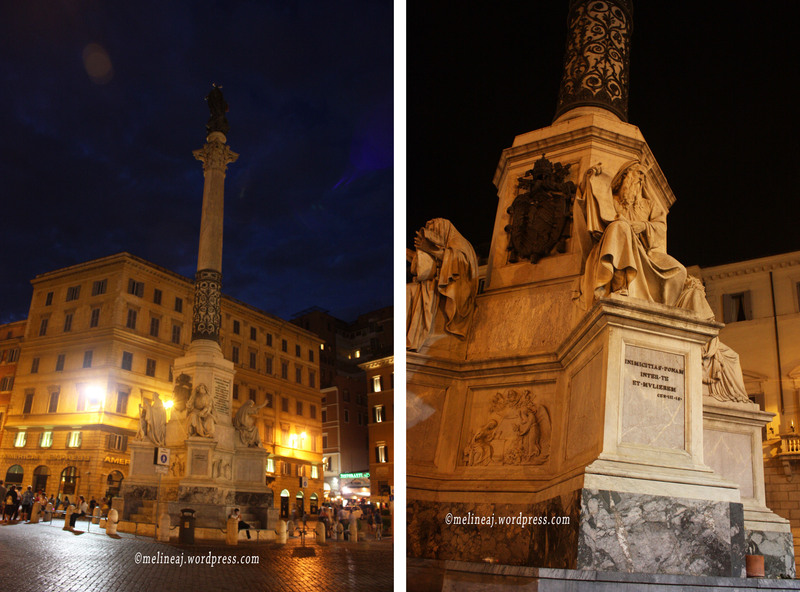 Outside the McD at the south-west of Piazza Spagna, the marble column of Colonna dell’Immacolata stands elegantly. At the base of the column, there are 4 statues depicting biblical characters: Moses, Isaiah, David, and Ezekiel. The Spanish Steps connects Piazza di Spagna (at the bottom) and Villa Medici (at the top). 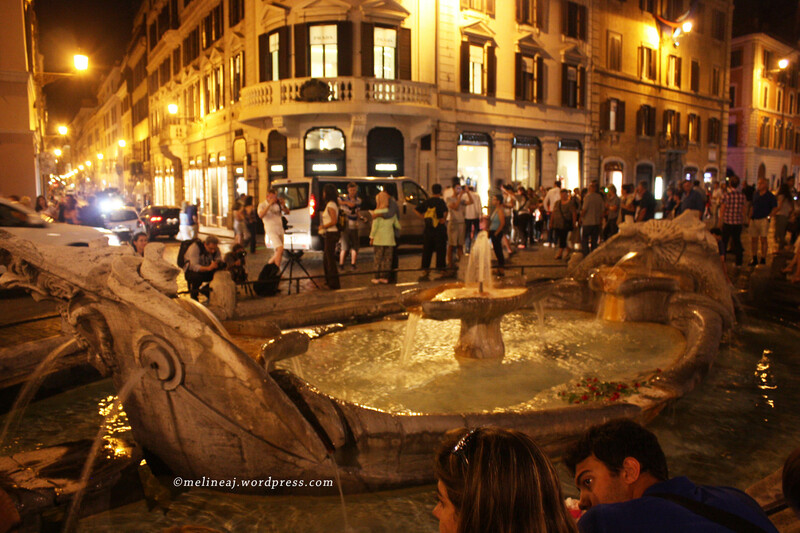 At the bottom of Spanish Steps, laid Fontana della Barcaccia (Fountain of the Old Boat). This fountain was built to commemorate the flood that often occurred in Rome in the olden day. Many people actually gathered here to take the picture of Spanish Steps. Along the stair toward the top, there were lots of people selling laser toys and fake branded purse. Again, we were guarding our belonging to avoid being pick-pocketed. At the top of the Spanish Step, there’s a church called Trinità dei Monti. We enjoyed the view of Rome at night from the top of the Steps and we could actually see St. Peter Basilica from there. However, I found it annoying that the people who sell laser toy kept pointing their laser at the church! It just ruined the beautiful view… grrrrr…. My impression of Rome for my first day there is that Rome is a walkable city. However, wearing a comfortable pair of shoes is a MUST since walking on the cobblestone street may hurt your leg if you wear heels. I fell in LOVE with the beautiful European architecture around this city as soon as I laid my eyes but Rome has a lot of modern shops too that gives the city a very contrasting picture. In Rome, there are lots of tourist information booths. We found one near Piazza Navona and the lady there was very helpful to show us where we wanted to go. Here, you can get a FREE map with Rome’s attractions OR if you happen to see a McD restaurant, you can ask for a free map too! Their map is pretty good 🙂 And for your pleasure, I leave you with the pictures of the high end shops around the Spanish Steps. I love their window displays! Enjoy!